"A young woman bored with modern life is lured by Bacchus into a colorful and mysterious world to explore her deepest desires." Two main characters, an internal conflict and an emphasis on dance, choreography and sensuality are the ingredients of this wonderful short produced at Danish school The Animation Workshop. Staged in urban locations and a fantasy setting, the short employs different aesthetics to represent each. A lot of work has been dedicated to these, the urban world is described with a stylized aesthetic and de-saturated colors, while the fantasy world is represented with colorful, increasingly abstract shapes. Framing and composition have also received a lot of attention. Medium and full shots are used to describe the woman, her environment and repetitive work, edited together with graphic matches and a nice dolly out camera move. Sound design is employed to further describe this world. Close-ups help transmit the woman’s facial expressions and internal conflict, as well as conceal Bacchus’ first appearance. As the woman enters the fantasy world and puts on the mask, cuts are replaced by transitions, camera moves become more frequent and visual rhythm is driven by music, bringing it to a crescendo. The abundant use of POV shots is worth noting, as it’s not easy to maintain first person narration in the visual medium for a long time, and the short successfully manages to do so. It also seems to incorporate codes from video games in some of the shots. The accent on sensuality and sexuality and the spontaneity with which they are employed are also worth noting, as they are a healthy expression of a culture and they are scarcely present in shorts coming from schools from some countries (France, in this case, must be mentioned as a notable exception). 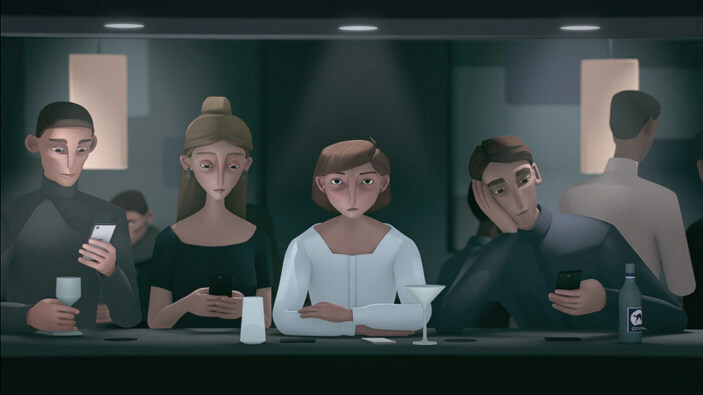 In this short these elements help produce an effective contrast with the urban, technological world, its disconnections and modern-day addictions, which as the short portrays, have already reached epidemic proportions. What makes it work so well? A widely appealing subject that the audience will easily relate to, abundant surprises, playful use of non-realistic staging which raises it above realistic narration mixed together with a good dose of humor, with a nice ending that breaks the fourth wall and communicates directly with the audience.